You can add an HTML or plain text legal disclaimer, disclosure statement, signature, or other information to the top or bottom of email messages that enter or leave your organization. To do this, you create a mail flow rule (also known as a transport rule) that adds the required information to messages. Users can apply signatures to their own outgoing messages in Outlook or Outlook on the web (formerly known as Outlook Web App). For more information, see Create and add an email signature in Outlook Web App. If you want the information to be added only to outgoing messages, you need to add a corresponding condition (for example, recipients located outside the organization). By default, mail flow rules are applied to incoming and outgoing messages. To avoid multiple disclaimers being added in an email conversation, add an exception that looks for unique text in your disclaimer. This ensures that the disclaimer is only added to the original message. Test the disclaimer. When you create the mail flow rule, you have the option to start using it immediately ( Enforce), or to test it first and view the results in the messaging log. We recommend testing all mail flow rules prior to setting them to Enforce. For examples and information about how to scope and format disclaimers, signatures, and other additions to email messages, see Organization-wide disclaimers, signatures, footers, or headers in Exchange 2016. Estimated time to complete each procedure: 7 minutes. For information about how to access the Exchange admin center (EAC), see Exchange admin center in Exchange Online. To connect to Exchange Online PowerShell, see Connect to Exchange Online PowerShell. You need to be assigned permissions before you can perform this procedure or procedures. To see what permissions you need, see the "Mail flow" entry in the Feature permissions in Exchange Online topic. Open the EAC and go to Mail flow > Rules. Click Add , and then click Apply disclaimers. In the New rule window that appears, enter a unique name the rule. In the Apply this rule if box, select the conditions for displaying the disclaimer. For example, select The recipient is located condition, and then select Outside the organization. If you want this rule to apply to every message that enters or leaves your organization, select [Apply to all messages]. Next to the Do the following box, select Enter text to enter the text of your disclaimer. For information about what can be added, see Formatting your disclaimer. Click Select one, and select one of the Fallback options if the disclaimer can't be added. Specify the audit severity level to assign the severity level that appears in the message log. Select the mode for the rule. Select Enforce to turn on the disclaimer immediately, or select Test without Policy Tips to put a message in the message tracking log instead of adding the disclaimer. If you have additional conditions or exceptions that you want to add, select More options at the bottom of the page, which will show additional settings. For example, to add the exception that prevents multiple disclaimers being added in an email conversation, select Add exception and then select The subject or body > Subject or body matches these text patterns, and then specify the words or phrases in your disclaimer. Or, to put your disclaimer at the top of the email message instead of the bottom, in Do the following, select Apply a disclaimer to the message > prepend a disclaimer. For more examples of how to scope your disclaimer, see Scoping your disclaimer. Use the New-TransportRule cmdlet to create the disclaimer rule. For detailed parameter information, see Mail flow rule conditions and exceptions (predicates) in Exchange Online or Mail flow rule conditions and exceptions (predicates) in Exchange Online Protection. This example creates a new mail flow rule that adds a disclaimer with an image to the end of all email messages that are sent outside the organization. New-TransportRule -Name "External Disclaimer" -SentToScope NotInOrganization -ApplyHtmlDisclaimerText "<h3>Disclaimer Title</h3><p>This is the disclaimer text.</p><img alt='Contoso logo' src='http://www.contoso.com/images/logo.gif'>"
This example creates a new mail flow rule that adds an advertisement for one month to the beginning of all outgoing messages. New-TransportRule -Name "March Special" -Enabled $true -SentToScope NotInOrganization -ApplyHtmlDisclaimerLocation Prepend -ActivationDate '03/1/2017' -ExpiryDate '03/31/2017'-ApplyHtmlDisclaimerText "<table align=center width=200 border=1 bordercolor=blue bgcolor=green cellpadding=10 cellspacing=0><tr><td nowrap><a href=http://www.contoso.com/marchspecials.htm>Click to see March specials</a></td></tr></table>"
Send yourself both a plain text email and an HTML email that match the conditions and exceptions you defined, and verify that the text appears as you intended. If you added an exception to avoid adding the disclaimer to successive messages in a conversation, forward your test messages to yourself to make sure that they don't get an extra copy of the disclaimer. Send yourself some messages that should not get the disclaimer and verify that the disclaimer is not included. 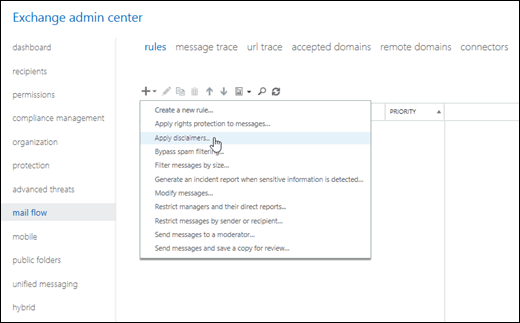 After you configure a disclaimer or email header or footer, see Manage mail flow rules for information about how to view, modify, enable, disable, or remove a rule.